November 2014 | It`s full of stars! 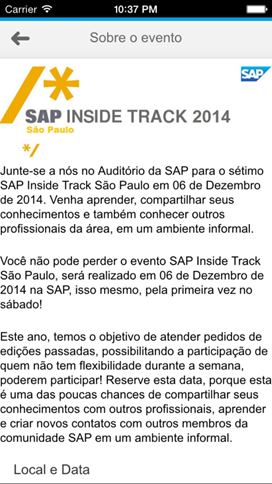 SAP Inside Track São Paulo 2014 will be held on 6.12.2014, Saturday. 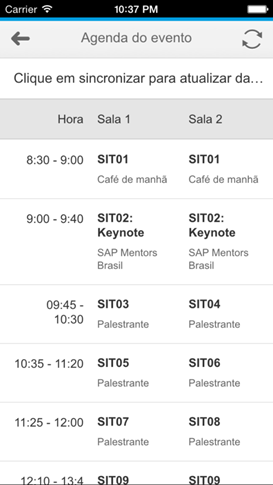 As we are committed to continuing offering the best non official SAP event in Brazil and the best SAP Inside Track experience, this SIT offers several improvements and new highlights. 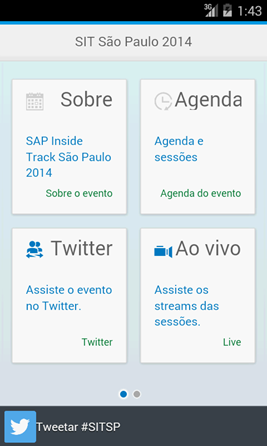 For the first time, the will be an official SAP Inside Track São Paulo app. While Bruno recorded the sessions for the last community events (SITs, SAP Forum dev track) and while SAP Connect was our tool of choice for remote participation for SITs, the overall quality of SAP Connect and access process is way too complicated. Early October I had the idea of an app for the event and while working on the app, I also wanted to include the possibility to assist the videos directly from within the app. If everything works out fine, the video will be streamed live in HTTP Live Streaming format and can be viewed from the app but also in the browser or via a streaming client like VLC. Before the event, the details on how to assist the live stream will be shared on Twitter or here on SCN. HLS videos are accessed using HTTP, allowing – in theory – to assist the video even in environment protected by proxies. This should make it easier for everyone to assist future sessions remotely even when SAP Connect or Youtube are blocked. Connecting to the community is one of the main objectives of every SIT. 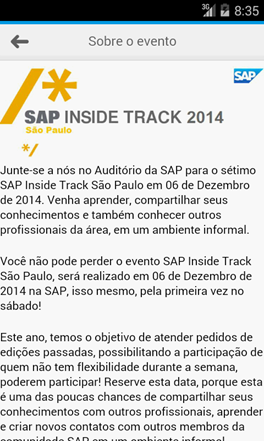 With the app we hope to bring you closer to SIT São Paulo 2014. 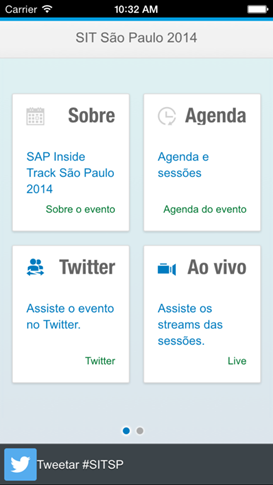 You can access event information, agenda, the live stream and interact on Twitter (#sitsp). The content of the agenda can be updated, keeping you up to date with the latest session changes. iOS: The app needs to go through Apples review process that is already started. When Apple is OK with the app, I will release it immediately. I hope to have the app available before the event starts. 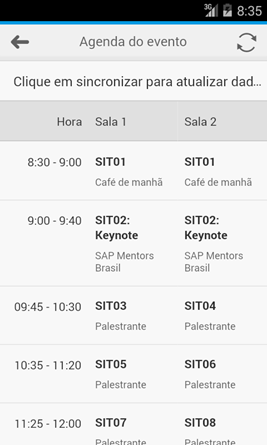 O Bruno gravou as sessões dos últimos eventos de comunidade (SITs, SAP Forum dev track) e SAP Connect sempre foi a nossa ferramenta de escolha para assistir o evento remotamente. Mas a qualidade nunca foi muita boa e se logar foi um processo bem complicado. 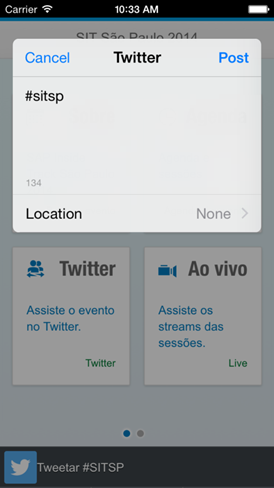 No começo de outubro tinha a ideia de fazer um app para o evento e também quis de incluir a funcionalidade de assistir as sessões ao vivo na app. Caso tudo funciona, as sessões serão transmitidos usando HTTP Live Streaming, permitindo a assistir usando a app, o browser ou um cliente como VLC. Os detalhes de como acessar o vídeo serão compartilhados no Twitter e no SCN antes o começo do evento. HLS vídeos estão acessados usando HTTP, permitindo – na teoria – o consumo mesmo em ambientes com acesso a internet controlado por um proxy. Integrando e conectando à comunidade é um dos principais objetivos de cada SIT. Com a app estamos ansioso a trazer o SIT São Paulo 2014 mais perto a você. 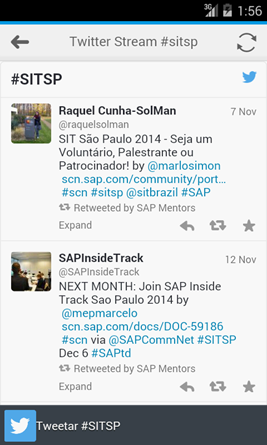 Você conseguirá acessar informações sobre o evento, a agenda, os vídeos e pode interagir no Twitter (#sitsp). A agenda pode ser atualizada, deixando você informado sobre a últimas alterações das sessões..
iOS: Depende no processo de verificação da Apple. O processo já foi iniciado, e quando Apple libera a app vou colocar no iTunes.